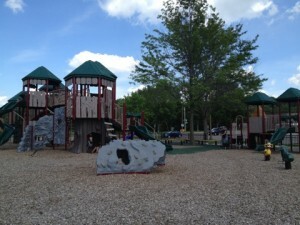 We were running errands in Eagan, when I decided to see if I could find the new playground off of Cliff by Hwy 35. That Hwy 35 ended up being highway 35W, not 35E so it was a little further away than I originally thought, but it was well worth the drive. Driving through an industrial area, close to Blackdog Lake and the Minnesota River, a beautiful new park with new landscaping popped up on my right. I almost passed it because the speed limit was pretty fast on that portion of the road. 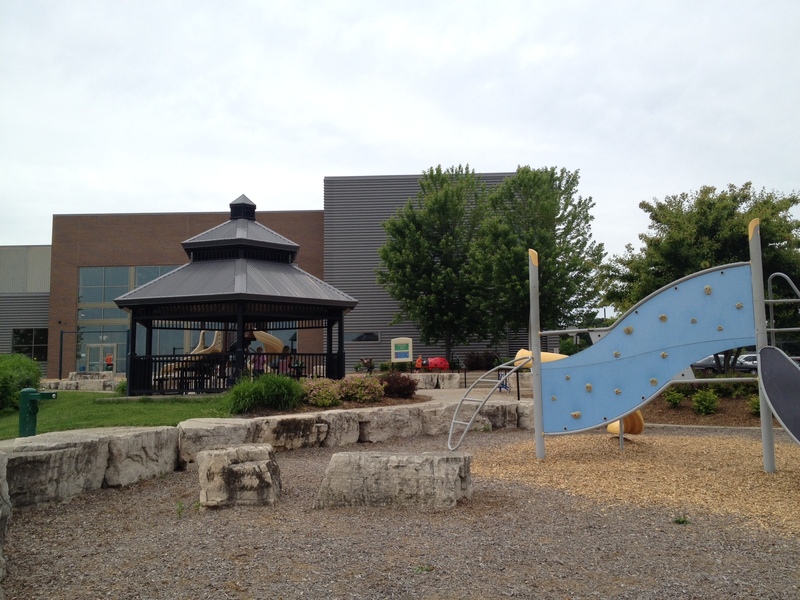 This park will soon be opening a splash pad at the same park in July of 2015. It is a good thing they have a very large parking lot. This will be a destination park once they add the splash pad, the playground is worth visiting now, even without the water area. This park has a large grass area holding about 6 soccer or football fields. The sand volleyball courts were on the other side. There were two port-a-potty’s by the large parking lot and both were clean with hand sanitizer. As my kids ran for the playground, I explored the nice picnic area, there appeared to be three separate covered structures with picnic tables. Plenty of space in the shade, if you want to make an afternoon out of visiting the park and pack your lunch. The exciting part was there was electricity and wi-fi in the picnic area. The playground is wonderful! The climbing rock wall had multiple sides with different levels of challenge for climbing. My kids loved the spinning, hanging, monkey bars. The swings were in great shape and included a handicapped swing. There was a two level climbing structure to explore with plenty of activities and things to look at. You could hear little kids yelling out Mom, Look! 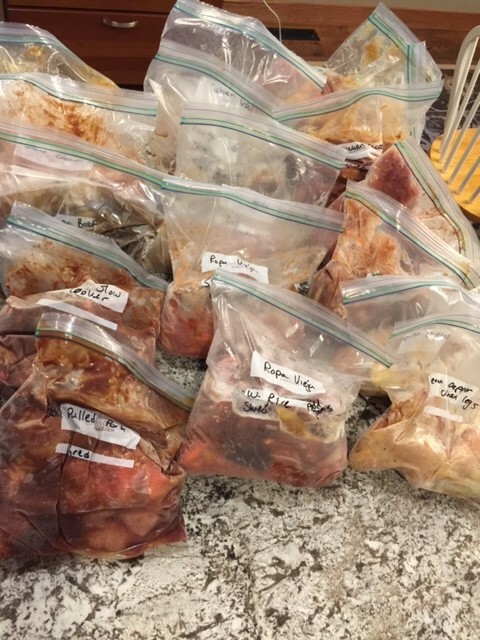 At all of the different activities to look at and explore. There were different ways to challenge children to climb across to the next structure. Many nice slides and plenty of ways to get from one level to the next. There was a separate structure for little kids next the the big area, with a few sitting toys to bounce on, and a small climbing wall, so they would not be missing out on any of the cool things their big siblings were exploring. As a parent, I liked the wi-fi, the shaded bench sitting area at the front of the park next to the small fence to keep your kids contained, and the huge parking lot. The negatives- This park is supposed to accommodate 265 children, I just don’t ever want to venture that far from home to encounter school groups having taken it over. It will be really busy when they open the splash pad. I really hope they add indoor bathrooms for phase two of construction, and in the hot sun we could have all used a drinking fountain. This park is out at the edge of the city, where you drive through the country area of Inver Grove Heights. Many people do not know that you can be this close to downtown and have plenty of houses on 2.5-10 acre, wooded lots. This is a big park with four nice soccer fields, 9 full size baseball fields, and the grass is so great your feet will be itching to walk barefoot in it. A bathroom facility in between the baseball fields and another bathroom facility, with picnic tables, is located by the soccer fields. There is a small pond that separates the playground area from the soccer fields. A small basketball area at the edge of the parking lot, and a tennis court. A paved walking trail circles and winds throughout the park. At the very south edge of the park is a small, old, white building with boarded up windows, this was the first school house in Inver Grove Heights. The playground has its own small parking lot with about 10 parking spots, if this lot is full there is ample parking in the large ballfield parking lot, on the other side of the tennis court. There are multiple slides to explore, plenty of ways to climb up to the top of the main structure, ladders, stairs, ropes, climbing wall, and exciting ways to get down, smooth slides, firepoles, and bumpy slides. 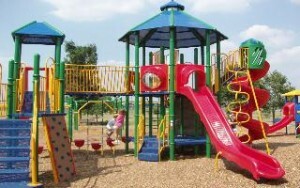 Next to the large, main playground structure is a smaller children’s playground area with low slides, mirrors and small tunnels to climb through. There are a few ride on spring toys and a small four way teeter totter. 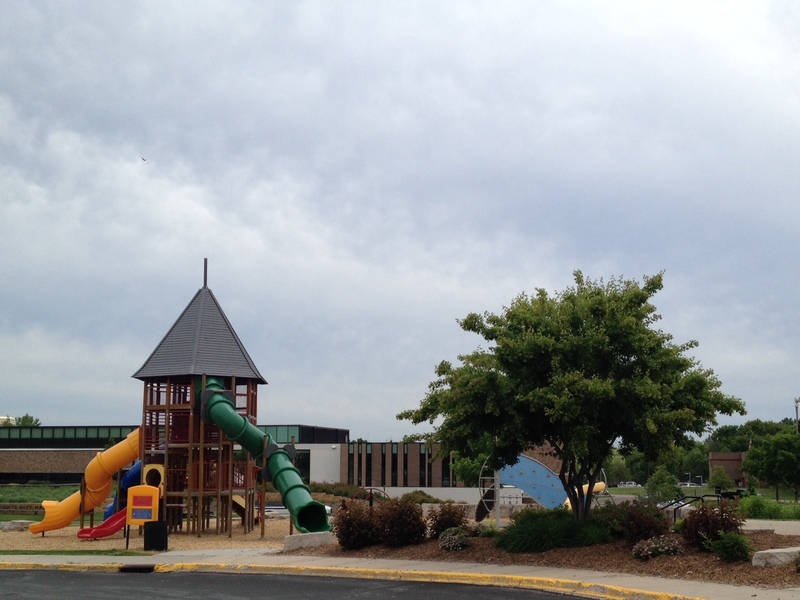 This park has plenty of swings, and the most fun part of the park for kids is the tire swing! There are is a climbing web, and spinning monkey bars, a metal zip bar, as well climbing structures to work on arm strength. The park has cute pods to walk on for balance, and slides of varying heights to keep even the big kids entertained. The large park has three more fun, spinning rides. For picnics the park has a covered shelter with 4 picnic tables, and a port a potty for emergencies, if you dont want to walk to the distance to the restrooms. This park was planned well with plenty of mature trees to keep you cool in the hot sun, and many benches for parents to sit around the edge and still see your children at all parts of the park. This is a great park, certainly worth the drive. The only thing that would make it better would be a drinking fountain or bathrooms near the playground. The negatives- the port-a-potty instead of flush toilets, it never fails your kids won’t want to leave and will need to use this potty (It always has been clean.) The main play structure is not for little kids, there is plenty of ways for your toddler to fall down 2 stories if they are not constantly supervised. Good thing the little kid area is right next to the big kid area. 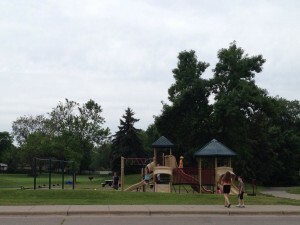 The positives- nice, well maintained, big structure with many different activities, the tire swing, and the mature trees to help shade the park. Don’t forget to walk over by the soccer or ball fields and check out the great grass, seriously, most parks are not this well manicured. 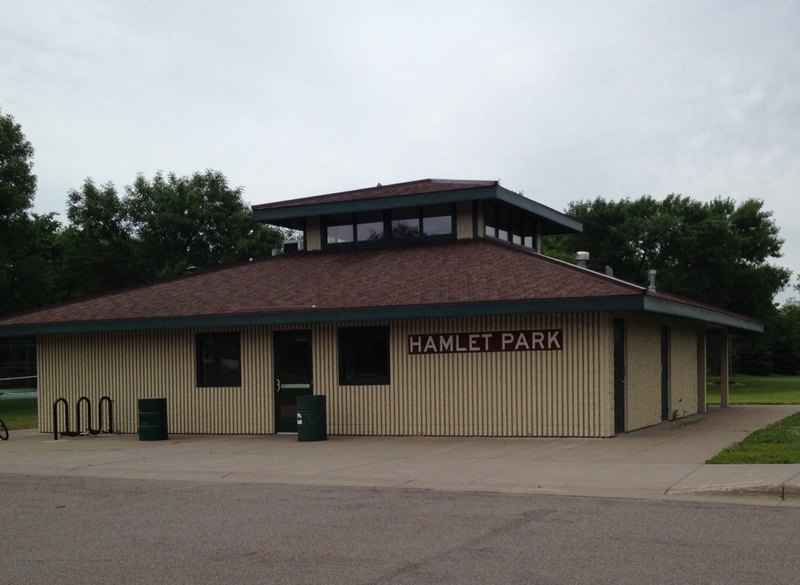 We were out in Cottage Grove and decided to try to find a big city park. We searched the city website and the majority of parks had tiny play structures. This appeared to be the largest playground equipment available other than their school parks. It is located on a nice, wooded piece of property that has been well preserved for many years. Trying to find it was challenging, we went through a neighborhood, down a few backstreets and kept cutting over to find the entrance to the park in the middle of a neighborhood of 1970 ramblers. When we pulled in I was pleasantly surprised to find a large park. They have great baseball fields, sand volleyball courts, big tennis courts, a hockey area in the winter and a nice walking paved walking path system. Considering all of this the parking lot was rather small. 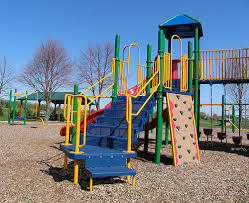 The playground is one of the first things you come up on the left. The kids liked that there were multiple swings that they could swing really high on. There were some bars to swing on, and a small playground equipment structure with monkey bars, and a few slides and stairs to climb up and down. This was enough to keep my kids entertained for about 20 minutes before we moved on. There was a port a potty next to the park, and an outdoor drinking fountain close to the ball fields. They have a nice structure for picnics and a well maintained small building for renting with extra picnic tables under a ceiling. We took a short hike on the paved trails, that were well used by bike riders and pet walkers, w we came around the backside and decided to watch the teenagers practice their skateboarding skills. We did not spy any future Tony Hawks, so we walked back to the car, ready to find our next playground. The negatives- It was a small playground for such a large park area, there was nothing to challenge my kids into wanting to stay and play. 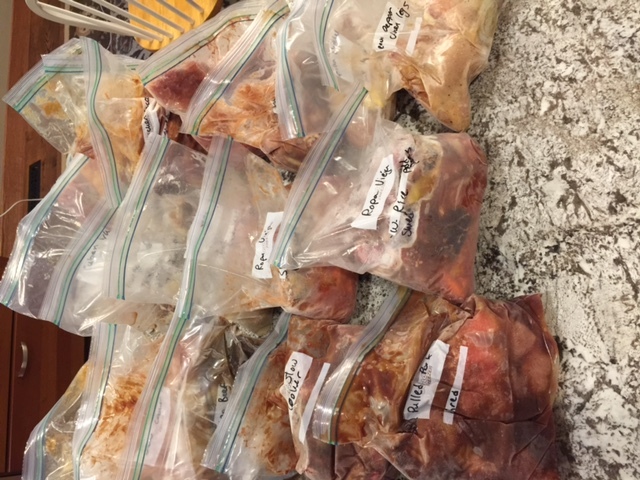 The positives- It was very clean and well maintained. When I go back to Cottage Grove, I am going to check out their new splash pad park. One of my favorite things to do in the summer is bring the kids to new parks. 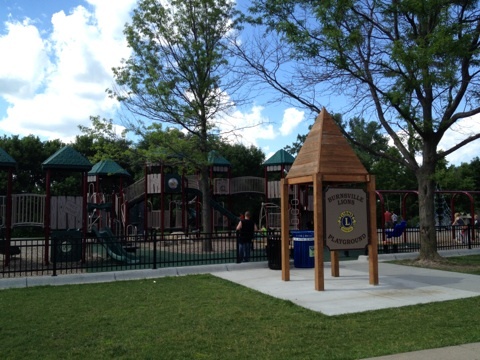 Exploring new parks is a cheap way to get exercise, keep playing fun, as well as exploring new neighborhoods and meeting new people. I discovered that it is really challenging to learn any information about parks other than what is published on city or county websites, so I decided to document my impressions on the places I visit. 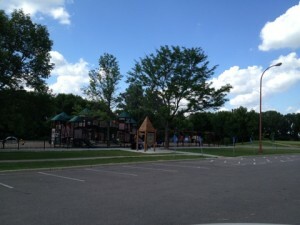 Inver Grove Heights has some nice, large city parks in comparison to surrounding communities. The Community Center Park is located next to The Grove Aquatic Center. This park has three different areas for children of all ages. 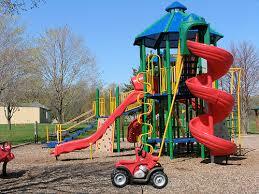 There is a small children area with toddler swings, a small children climbing structure with slides and low stairs. There is a little area that my kids used to play house in, there are a few ride on spring toys and there is a sand/gravel digging area. There is also a bigger kid area with a multi-level climbing structure with 3 tube slides, and one straight slide and a climbing structure in addition to two toys to bounce or spin on. There are flat rock stairs separating the little kid from big kid areas, to help keep your little kids away from the big kid area when they are in the fast, but fearless, toddler age. When your kids are ready to go onto the tall structure, make sure you warn your children to watch their heads. There are red structural bars that are the exact level of a 5-year old’s forehead about every 10 stairs. Every time I am there, I see a poor kid, so excited to climb the stairs to go down the sides, who does not see the bars, and bumps their head. The good news is they only bump their head once, and never forget the bars are there again. There is spinning platform on pole and one of those bouncy teeter totters that bounces off of the tires. 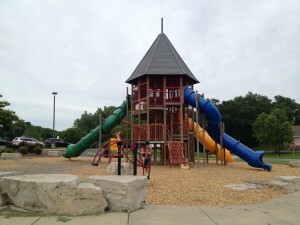 There is also a strange climbing structure that looks more like art than playground equipment, but it is fun for kids who are strong enough to try to climb and slide down. There is a short wood chipped trail to lead you around the pond or to the skate park on the other side of the building. There is also a very pretty shaded gazebo area if you are lucky enough to have children that are old enough to play on their own. There is an outdoor drinking fountain and you don’t even need to worry about a stinky, port-a-potty, you can use the clean, indoor bathrooms in the building right next door, inside The Grove, Community Center. The downfalls, during the day there may be the school age care program on the playground equipment and watch out for those goofy red support bars. The positives, It has awesome 2 and 3 story tube slides, a great area for little kids separate from the big kid area and when your kids are old enough, you can sit and read a book in the shaded gazebo while they play.